Tooltip fix and optical margin align? Hi! Trying the beta today for the first time. I noticed when hovering around to read tooltips that the one for "Position" (superscript/subscript) incorrectly reads, "Vertical Scale." (This is the last option in the "Positioning and Transform" palette. 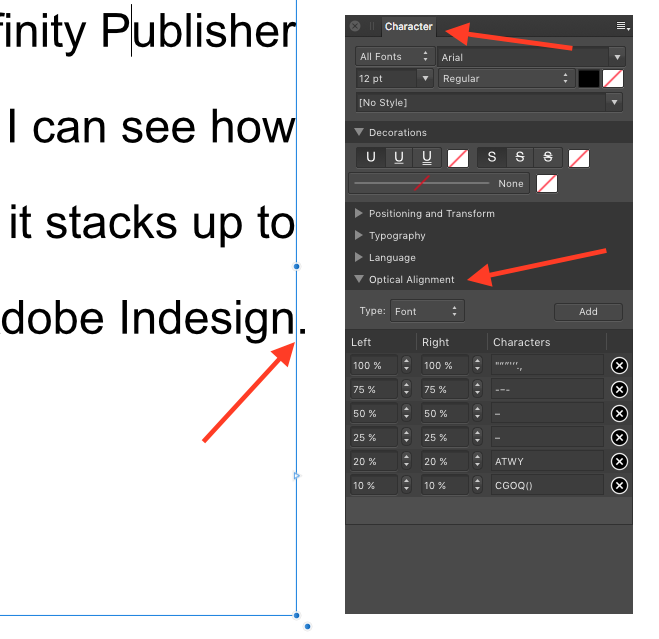 One thing I'm not seeing yet--and wonder if I just haven't found--would be what Adobe calls the "Story" palette and the "Optical Margin Alignment" feature. Is there such functionality in Publisher? Also, is there a way to change the default increment to a smaller amount so that arrow key nudges for kerning/tracking from the keyboard are more subtle? It's in preferences in Adobe InDesign and I set mine to 5/1,000 of an em instead of Adobe's 25/1,000 default (I think). Great job so far! (I am anxious for a professional InDesign replacement.) Thank you! Optical alignment can be found on the Character Panel, with lots of great tweaking options. Thanks, A_B_C, but I have checked out the character panel, the paragraph panel, and the extended typography panel options and don't see optical margin alignment. See my attachment: What I am looking for would allow the program to automatically push out the period at the end of the sentence into the right margin so that the copy visually looks lined up. This is very important to me on small body copy columns with quotation marks and the like. Thanks for your input! Thanks, A_B_C, but I have checked out the character panel, the paragraph panel, and the extended typography panel options and don't see optical margin alignment. Can you post a screenshot of what the fully expanded Character Panel looks like on your Mac? Have a look at my screenshot. This is the panel you will have to take a look at. Maybe you will just have to scroll down a little on the Character Panel to see this option. I believe the Optical Alignment option will still require a few tweaks but for a start it is pretty useful. This is one of the features that is great--far better than ID's weak implementation. It's basically like QXP. But Q's implementation is a bit better in that so-called optical alignment in Q are styles that can simply be attached to any p.style one creates instead of recreating them or basing new styles upon other styles. Mike and Alex: Excellent, thanks! Just found this at the very bottom of the character choices, after scrolling. Sorry for troubling you, but thought I had looked everywhere. Have a wonderful weekend! Thanks, Mike. 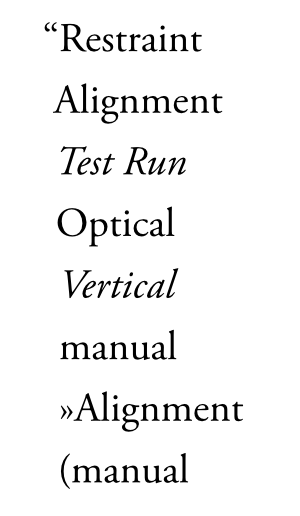 We were expecting the Optical Alignment settings to be defined once, in a base style that all other paragraph styles are based on, and at most tweaked when the font is changed. You should be able to switch them on or off in a derived style without editing the table. Are you needing multiple different tables in a document? We also have the option to use the settings defined by the font's OpenType features. In an ideal world this would reduce the need to edit the table even further. In practice I couldn't find many fonts that bothered to define optical alignment. We add the support anyway, hoping that font designers would see it and leap to update their fonts to take advantage. Feel free to report if this doesn't work as you'd expect; as I said, it hasn't had a lot of testing. I haven't worked my way down to this feature yet, at least in earnest. But I'll play with it to look at the values in a real document. 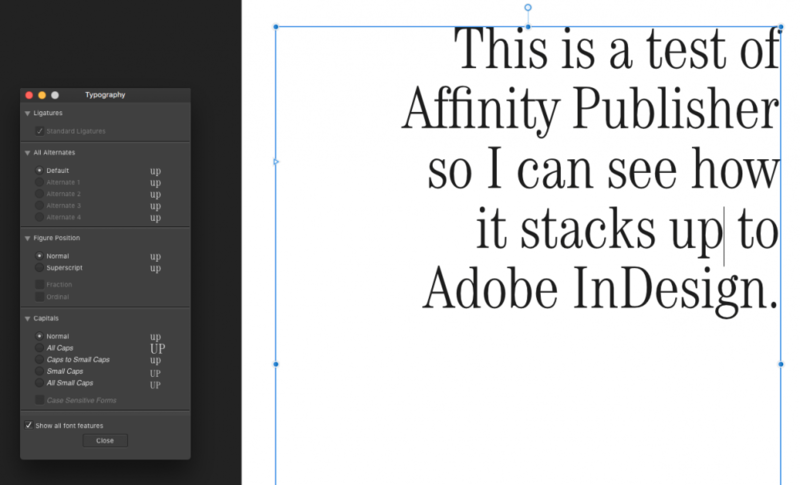 I'm currently porting a newspaper template I made to APub. Then I'll have something worthwhile to compare. The based on thing I figured out. And it does propagate as mentioned. I put that in just to keep you busy. I figured as much. When I go back to work on Monday I'll have to play with it. @Dave Harris Any chance you are also working on optical kerning ? As for optical margin alignement I didn’t ask for it before thinking you’ll get to it when working on Affinity Publisher but I didn’t find anything new on that side. We provide kerning based on tables in the font file. As these are pretty well supported by fonts, doing anything more isn't a priority at the moment. Regarding the optical alignment, I would suggest a few additions. 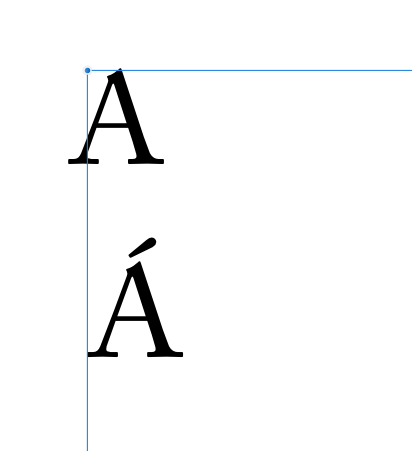 First off, it is somewhat odd that characters with diacritics are not included in the standard alignment lists.  For instance, the letter A will be optically aligned, while the letter Á won’t. I would suggest that you follow a class-based approach, since the number of characters with diacritics included in different fonts might be different. 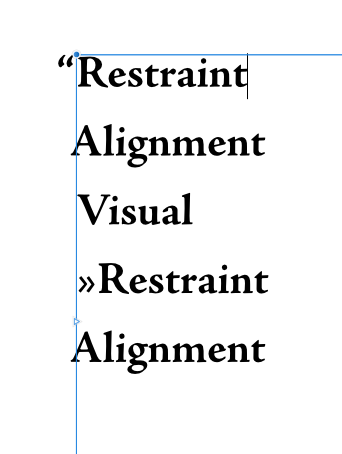 So adding uppercase A to an alignment list should include all related composites in the font. Secondly, I believe that some of the alignment classes will have to be extended. Just have a look at the V and the A in my example below, or at the guillemets. That doesn’t look really nice. But looking at other examples, it is easy to see that the same values do not always work nicely for different fonts. A typeface with light and tiny guillemets will need more correction at this point. So I think we will need a simple way of creating overrides. What if adding a new alignment rule to the bottom of the value list would simply override all rules above, with respect to the newly added characters? This way we would not have to search the entire list in order to make adjustments. And finally, I would suggest that you develop of a concept for integrating italicised sections of a text. I believe you could do a pretty good job here by reading out the italic angle from the font file and come up with a nifty formula for adjusting the alignment values when a line starts with an italicised word. 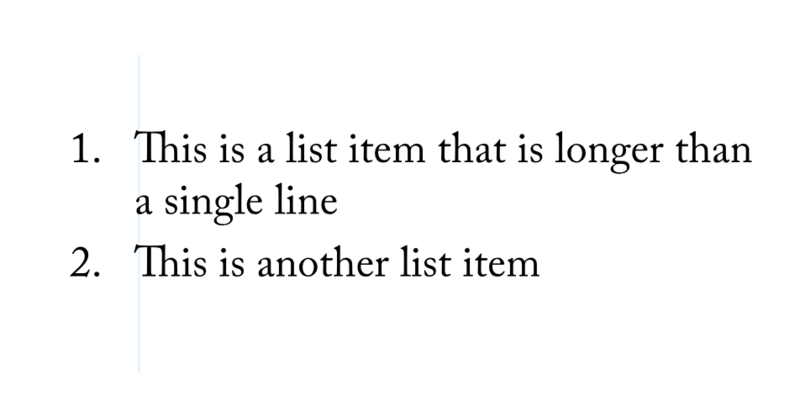 You will see in my example that it is technically impossible to create an optically satisfying solution for italicised line starts (or endings) at the moment. This would be a great improvement. Oh, and what would be tremendous and much needed: Add optical alignment to tabs and indents. Thanks, A_B_C. We'll add optical alignment for tabstops and accented characters. I think searching the table top-to-bottom gives a more natural priority order, but we'll add new entries at the top, so they are found first and also are easier to spot by humans. Automatic support for italics would be fairly involved. Italics would affect A differently to W. To get it right would mean looking at the shapes of the letters. We might consider doing this one day, along with automatic optical kerning, but not for some time. Ideally, the font designer would provide optical alignment via OpenType features. They could get italics right without us needing to do anything. In the mean time you can edit the manual table for styles that apply italic fonts. This is one of the reasons we made it a character attribute rather than a paragraph one, so it could be included with character styles that change font and/or italics. Dave, am I correct you are using the bounding box to determine what say 10% of a character is for hanging it? Personally, I think that APub's optical margin alignment is better than ID's. And I am not really seeing the issue as regards italics...but I may be missing something even reading the thread twice. In the screen shot below, APub on top, a screen shot from ID was pasted in. I think ID sticks the bottom serif of the italic A out too far. It's not just about APub being more even compared to the cap W, it's just that A bottom serif looks wrong in ID. 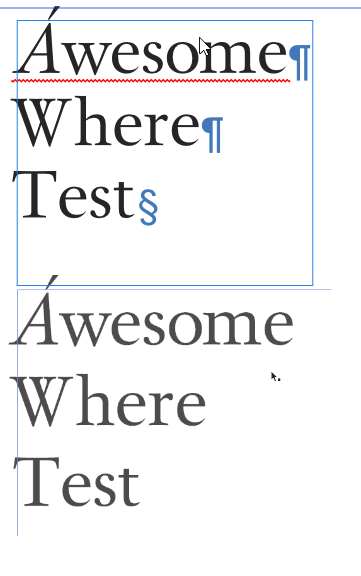 I also noticed that if I switch the font being used to Times New Roman, the results are even worse for the cap A in ID (pushes out even further) and in APub are still nicely even (visually, not just measurably). Which then leads me to believe it is either bounding box/LSB dependent in APub and ID just gets it all sorts of wrong. We check for 'lfbd' and 'rtbd', and we currently ignore 'opbd' completely. No, we currently use 10% of the character's width.